Borrowed chariot: Do I have to give it back? Drivers in "green" vehicles will escape paying congestion charges mooted for inner cities. But what are they like to drive? We take a spin in an electric car. I'm sitting at the lights in my (borrowed) plastic car, waiting for the red to go green. In the next lane, a white van man eyes my itsy bitsy teeny weeny two-seater and revs with intent. I try to gun my motor in reply, only to raise a faint hum. A sewing machine on wheels would sound more impressive. But I show him when the lights change. Small and silent as the car is, it accelerates like a dream... until I'm brought up short by gridlocked lunchtime traffic. 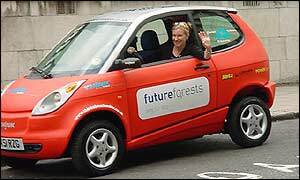 The car is a Ford Think, on loan to the environmental group Future Forests as part of a trial in London. Electric cars will be exempt from congestion tolls set to be introduced in various cities around the UK. Submissions on London's proposed charges closed on Monday. British drivers who want to make the switch from petrol won't be able to buy their own electric car for some time yet, but will be able to lease one from Ford by next year. "Oy - is that thing made of plastic?" yells a curious passer-by. "What sort of speed can it do?" The car sure is quick off the mark at the lights, and stops sharply at the merest tap on the brakes. With a top speed of just 50mph, it won't be breaking any land-speed records, and probably won't be getting any speeding tickets either. At less than three metres long - and with a tight turning circle - the car is small enough into squeeze into the tightest of parking spaces. So how come I still manage to bump the kerb while performing a none-too-tricky parallel parking manoeuvre? I blame the Scandinavian designers, who put all the controls on the left just because they drive on the wrong side of the road. So there. It's red, it's plastic, and the sight of it makes passing sports car drivers double-take, probably because a plastic bubble car offends their sense of automotive aesthetic decency. But plastic can be fantastic - the polyethylene body is scratch and dent resistant. It topped its class in standard European crash tests. And on a sunny day, the light makes the plastic body ever so slightly translucent. Pretty. Even idling at the lights in central London, it's easy being green. No petrol means no exhaust fumes, and its rechargeable battery means no noise pollution. Hence electric cars will be exempt from the £5-a-day congestion toll. Traffic wardens, too, are being briefed to recognise electric cars and waive parking fees. Tanking up at the mains rather than the petrol pump also puts less pressure on the world's depleting fossil fuels reserves. No wonder pedestrians are smiling at me. Or perhaps it's because I'm driving what looks like an outsized toy. Why own a car when you can share?